Lake Bratan is situated on the highland about 1500m above sea level. 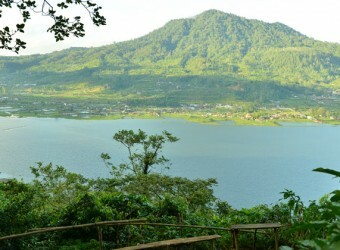 Around there, there are the good view restaurant of Budugul’s three major lakes (Bratan, Buyan, Tamblingan), Ulun Danu Bratan which is the beautiful temple often on the post card, and the famous Handara Kosaido Country Club, and many family tourists visit. Mountains in Bali are beautiful. If I have the chance I’d like to challenge trekking. It didn’t rain, and I took a few beautiful pictures like postcard.